Are you losing revenue with mismanaged leads? Are you part of the astonishing 40% of sales reps who use informal means to manage your lead and customer database? If so, the bigger question then becomes, what is your “opportunity cost” from not using technology to manage both inbound and outbound generated leads? What potential revenue growth are you losing? “Opportunity cost” refers to something you forego as a result of making a certain decision to do or not do something. While this is often an overlooked part of the decision-making equation, it often reveals insights and additional opportunity. There is a reason, according to the State of Inbound 2016 report, that 45% of successful companies use a CRM (Customer Relationship Management) software to manage their lead and customer data. Even though the chart shows a significant increase in the implementation of a CRM, there is still a great deal of potential lost or mismanaged leads and in turn revenue that still exists because tools and systems are not being used to support the sales team efforts. Planning for 2017? Don’t go unprepared. Know marketing trends and challenges. Get the statistics in the State of Inbound 2016 report. A Customer Relationship Management (CRM) is a system that supports the management of prospects, leads and customer data to nurture and manage the relationships. The CRM is typically in-the-cloud software, which helps in collecting, organizing, and managing the prospect, lead and customer data. The optimal CRM is one that integrates with other systems such as a marketing automation platform or accounting system to ensure a seamless management of data. Typically, a business uses some form of accounting system, inventory system or human resource system to collect and manage data for which to make decisions. Think of the CRM in that similar fashion. You wouldn’t run your business without those systems, so why would you run the most valuable part of your business that generates sales without a system? 1. Increased Revenue: With a good CRM at their fingertips, both sales teams and managers are able to quickly access information, make quick decisions and deliver accurate sales data that will generate profit. 2. Improve Cross-Selling and Upselling. Using the data from the CRM, sales managers are able to detect opportunities for upselling or cross-selling to existing customers based upon their previous purchase history. According to Harvard Business Review, acquiring a new customer is anywhere from five to 25 times more expensive than retaining an existing one. 3. Effective Marketing. Using data collected from the CRM, both sales and marketing can gain a better understanding of the needs and behaviors of their prospects, leads and customers. This information will help support more targeted marketing campaigns that result in higher ROI. 4. Improve Communication. A CRM provides the opportunity to share prospect, lead and customer data across various internal departments to enable greater efficiency, reduced duplication and improved knowledge, which results in improved communication across the organization. 5. Enhance Accountability. A CRM fills the missing gap for effective sales goal management between the sales rep and the manager by ensuring the responsibilities at each stage of the sales and customer lifecycles are met. Barriers to Implementing a CRM? 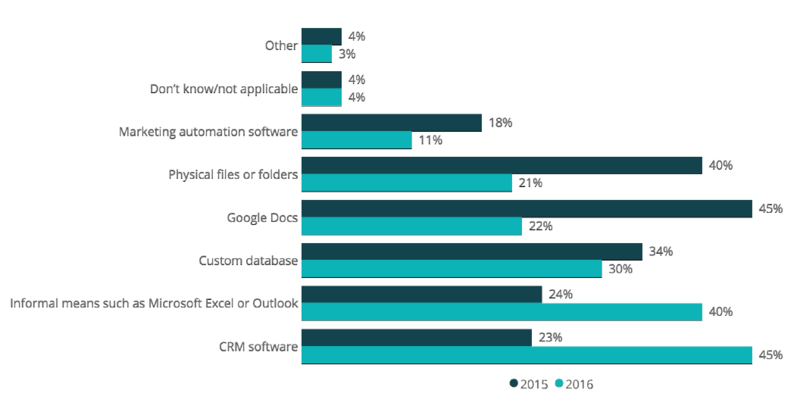 What’s stopping companies from implementing a CRM to manage critical sales data? According to the State of Inbound 2016 Report, the majority of non-adopters are hamstrung by a lack of budget. 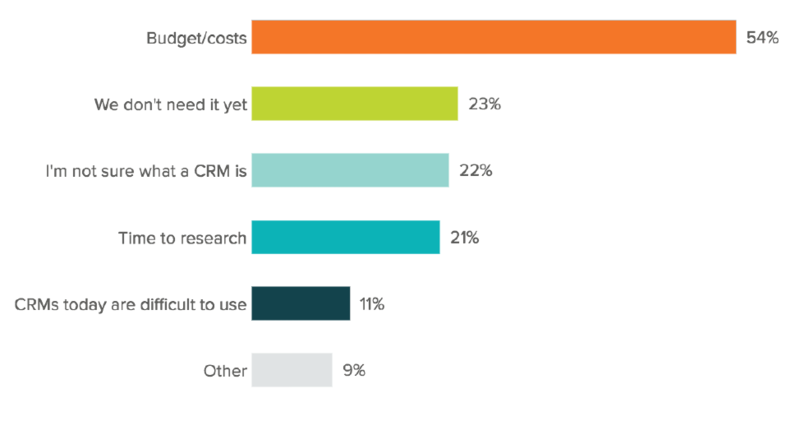 However, even more concerning is that 22% of surveyed respondents indicated they weren’t sure what a CRM was. The cost of not following up on 5 prospective leads per week. The cost of not documenting customer related intellectual property from your sales rep when they leave and take that data to your competitor. The cost of unrecognized sales because you didn’t have data to even realize the potential existed. The cost of not gaining behavior insights in each stage of the sales funnel during the buyer’s journey. Succeeding in today’s competitive sale environment requires more than simply sending sales reps on hunting expeditions for new business. If you’re a growth-driven business, investing in a CRM system is an essential part of your strategy. Selecting and implementing a good CRM that supports both outbound and inbound sales and marketing efforts and interfaces with other internal systems is an investment that pays for itself over and over again by increasing profits. It’s beyond time to trade in the Rolodex and sticky notes for a system that increases efficiency, productivity and provides the data necessary to grow your sales and make sound business decisions for the future.